Having always loved the guitar and working with wood in general, in 2001 I decided to try my hand at building a guitar of my own design. 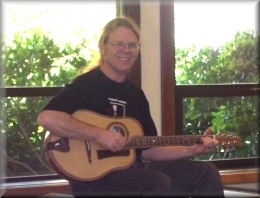 It was a wonderful project that took nearly a year to complete, but was definitely worth the time and expense when I first held and played that finished instrument that had been created with my own hands. I hope you will enjoy watching the process I went through building my first guitar, my current project of building a matched set and even a few photos of guitars I have collected. 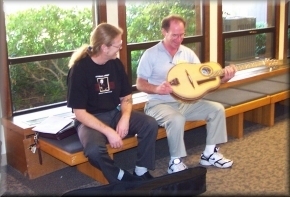 Bob Benedetto checking out Micheal's first guitar at the Luthier's Convention - July 2001.